I’m going to make an unusual departure from the gospel story as the starting point for today’s homily. The gospel may be the preferred choice for most homilists, this being the Year of Mercy. My starting point, however, begins in the first reading. It is the tail end of a sordid tale of adultery compounded with murder. The main story-line deserves an R rating and I won’t be surprised that some of you may choose to walk out as it would seem an unfit story to be told in the presence of children. So, parental guidance is strongly recommended. Here the greatest king in the history of Israel, a proverbial success story of a simple shepherd boy who became king, is tarred by this indelible black mark on his otherwise seemingly pristine record. Not just a simple petty crime. but two of the worst sins imaginable – adultery and murder. What seems worse was David’s lack of repentance or ownership of his crime. There was no indication that he had regretted his actions or even felt the slightest guilt for this heinous crime. Perhaps, David was seduced by his own self-importance. Perhaps, he believed he did not have to answer to anyone as he is king. But the Lord sent Nathan to hold him accountable. One would expect a protest or at least a lengthy defense. But David makes a simple confession, “I have sinned against the Lord.” No excuses, no quibbling, no finger pointing, no scapegoating, no public display for sympathy. God accepted David’s remorse and forgave him, but the costs of David’s action could not be undone. David would pay a painful price in troubles that would come to his family, largely because of forces his sin had put into motion. God did not remain aloof or silent in face of the sin and great injustice committed by David. It would not have been mercy, if He had chosen to do so. God, however, sent Nathan to David to talk about what David had done, to say that it was not “OK”, to convict David of his sin. Admonishing and correcting the sinner is never an expression of judgmentalism but rather a neessary spiritual work of mercy. But the amazing thing is the story does not end there. Our lives are formed, accountable and answerable to a gracious and merciful Father. But we are not only the accountable and responsible. We are also the forgiven. Our sin, serious and consequential as it is, does not defeat us. We can confess the truth of our sin; we can receive forgiveness; we can start over, begin again. How? Through God’s forgiving grace. This is the amazingly good news which we have to announce to the world today. The woman in today’s gospel, however, has an entirely different disposition. She is aware that others know of her reputation. She willingly submits to the crowds’ derision and to Jesus’ host mocking stares and even judgment. She comes with true contrition in her heart. Contrition is proven by her tears. It is as if St Basil, the father of Eastern monasticism, once wrote, “Weep over your sin: it is a spiritual ailment; it is death to your immortal soul; it deserves ceaseless, unending weeping and crying; let all tears flow for it, and sighing come forth without ceasing from the depths of your heart.” Those tears were an outward sign of her inner repentance that unlocked the flood gates of mercy. 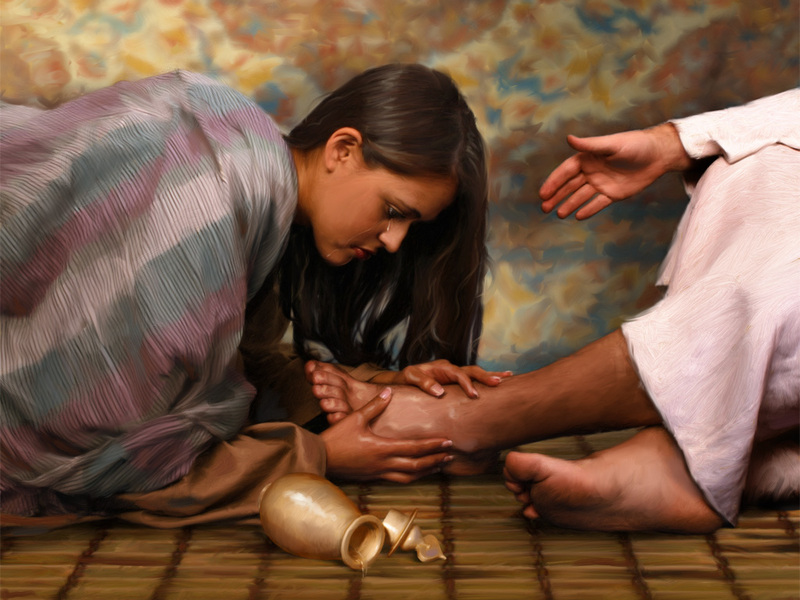 Notice the irony, the woman washed Jesus’ feet with her tears and He washed her soul with his redeeming grace and mercy. She offers Him her love, because through the gift of forgiveness, she now comes to realise how much she has been loved by the Lord. Jesus fully understands the reason for this woman’s love for him. He provides us with the litmus test. It is those who have been forgiven much that are capable of loving much. Simon the Pharisee saw no need for forgiveness, thus his love remains small and miserly. Forgiven little, love little. David acknowledged his own guilt before God and experience an outpouring of mercy and forgiveness. This must have certainly made him a better king, not a perfect one though, but a better king nonetheless. We love God in proportion to how much we understand we have been forgiven. Forgiveness expands our ability to love. It’s a cause-and-effect thing: His forgiveness is the cause; our love is the effect. It may indeed to be shameful to acknowledge that we are a sinner, in fact we may be a big sinner. But the good news is that we have a bigger Saviour. In just a few moments God will reassure us of His love and of that forgiveness in a very real and personal way as he comes to us in the bread and wine of the Lord’s Supper. Healing and forgiveness are intertwined with this banquet which the Lord prepares for us. The sick is healed, the sinner is forgiven, and incredibly the outsider is ‘invited’ not only to the table but also to enter into communion with Christ and His Church. The most undeserving of people are given a place at the table – to be heard, healed, forgiven, restored, taught, fed and to become beneficiaries of divine hospitality. There is only one criteria needed – we are sinners in need of forgiveness, in need of healing and in need of salvation. Those who think they are well, who think they have no need for forgiveness, have no place at the table. But those who come with the heavy baggage of sin, we have come so that our burdens may be lifted, our guilt removed, our sins forgiven, and to receive a new life in Christ, the One who forgive sins and restores us to our rightful place with God.